I must admit, this month’s Recipe Redux member challenge threw me for a bit of a loop. The challenge? Whip up a recipe that can be made (or served) in a jar. Due to an (admittedly irrational) fear of killing all of my friends with botulism, I don’t participate in the art of jarring or canning. For me, the whole concept is simply too fraught with danger. I did attempt an overnight muesli, which totally fell flat (and I broke a tooth eating…long story). Finally, with the mercury rising to 90 degrees, I got to thinking about serious (and delicious) thirst quenchers. Sports drinks are not an option (unless I’ve just completed a marathon…unlikely). I’ve never been a fan of soda/pop/tonic/soft drinks (even when I was a chubby girl). And though an ice-cold beer can feel very thirst quenching in the moment…too many of them and soon your needing a recipe for a hangover remedy (sorry….none here). Enter shrub (or drinking vinegar as it’s sometimes referred to). Never heard of it? …you’re in for a treat (and, as luck would have it, It’s perfect for making (and serving) in jars! First a brief history lesson. During the colonial era, early settlers of the USA used vinegar (instead of citrus) to preserve fruit (primarily berries). After pouring vinegar over fresh berries, they would let it sit overnight or for several days. Once the berries were strained from the liquid, they would add a sweetener and reduce it to create a syrup. The syrup was typically enjoyed straight or with carbonated water. Many cultures have used vinegar for medicinal purposes for thousands of years. Many believe that consuming vinegar aids in digestion, helps lower cholesterol, aids in bowel health…even sure hiccups. While I can’t claim any of these claims to be true, I can confirm that one of the things that shrub has always been seen as is an effective (and tasty) thirst quencher. This recipe does not require any cooking and incorporates stone fruit and ginger instead of the more traditional berries. Instead of refined sugar, I opted for honey. Much like cooking with wine, you’ll want to use a good vinegar for this (try to stay away from cider and distilled white vinegar). I used a mild white balsamic for this batch. I suspect a champagne vinegar would be yummy, too. Though it was pretty spot-on after 24 hours, it was even better after a couple of days. You’ll want to shake the jar a couple of times a day while it’s ‘brewing’. Serve with seltzer or mineral water for a great, low-sugar, low-calorie alternative to soda. PS—the acidity of the vinegar keep bacteria at bay, so your friends won’t die from botulism (though they’d probably have a smile on their face :)! 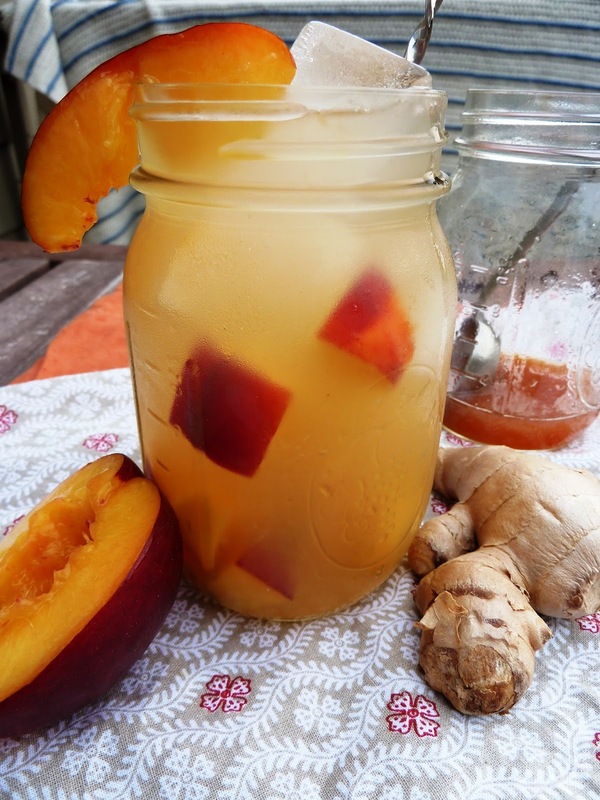 To serve: Add ice and a few pieces of cubed peach or nectarine to a large festive beverage glass or mason jar. Add 2-3 TBSP. of the shrub to the glass. 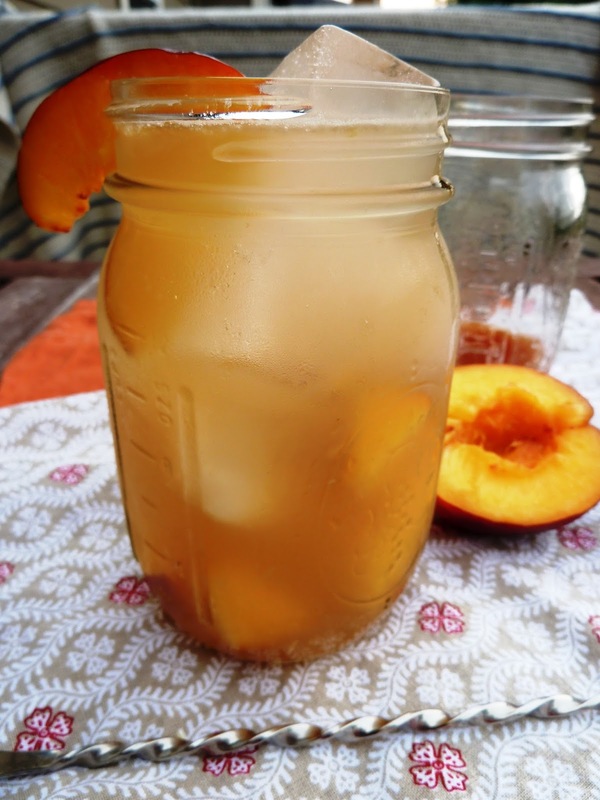 Top with seltzer and garnish with a slice of peach or nectarine. Never heard of Shrub, but after reading this, I will surely try it out. 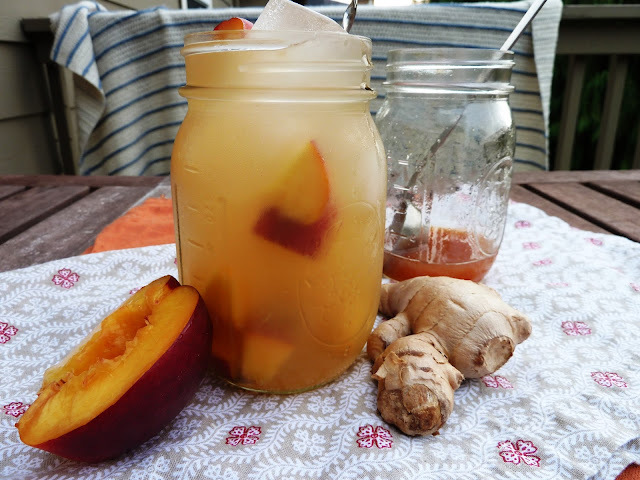 I absolutely love the peach, honey and ginger combo. Cheers to Shrub! Let me know what you think Ashley! Oooh looks so refreshing! I’ve read about shrubs but never had tried one – and I hope your tooth is oK!